Dizziness can sometimes occur primarily in the morning for a number of reasons. It can be concerning and irritating to deal with, especially if it stops you from carrying out your usual daily routine before it passes. Acknowledgement of some of the reasons behind morning dizziness is valuable in order to help you understand why you might be experiencing it, and consequently the actions you can take in order to treat or even prevent it. Below, find some helpful information all about feeling dizzy in the mornings. Dizziness is a term that many women use interchangeably with vertigo and other words, meaning it can signify different things to different women. In general, sufferers of morning dizziness describe a feeling of lightheadedness and imbalance, along with a sensation of all-round unsteadiness. Sometimes, it occurs in conjunction with headaches and nausea, although this will depend on what is causing it. Morning dizziness can be caused by various factors. Read on to discover what some of the more commonly-seen reasons are. Both of these substances can be detrimental to health if they are consumed in large amounts. Alcohol can not only dehydrate you, but it can also lead to nausea and headaches, especially during the morning after you have had a lot to drink; these effects are collectively referred to as a hangover. Caffeine too can have a negative impact on your body. If overingested, it can reduce blood flow to the brain, which could lead to feeling dizzy or lightheaded. It is recommended that all adults get a minimum of seven hours of sleep each night. If this quota is not met, then the body can suffer in a number of ways, including feeling feint and dizzy. During the night, many processes happen in the body that support your health and provide you with energy, so getting enough sleep is essential. Also known as hypoglycemia, it is possible for anyone to experience a touch of this condition - whether you suffer from diabetes or not. The body requires a sufficient amount of energy in the form of glucose in order to run effectively, and when these levels dwindle, it can cause fatigue, weakness, and dizziness. Many women suffer from a condition known as orthostatic hypotension, which involves feeling dizzy or lightheaded when you sit or stand too quickly. This sensation is caused by a sudden dip in blood pressure, but it usually passes after a few seconds. 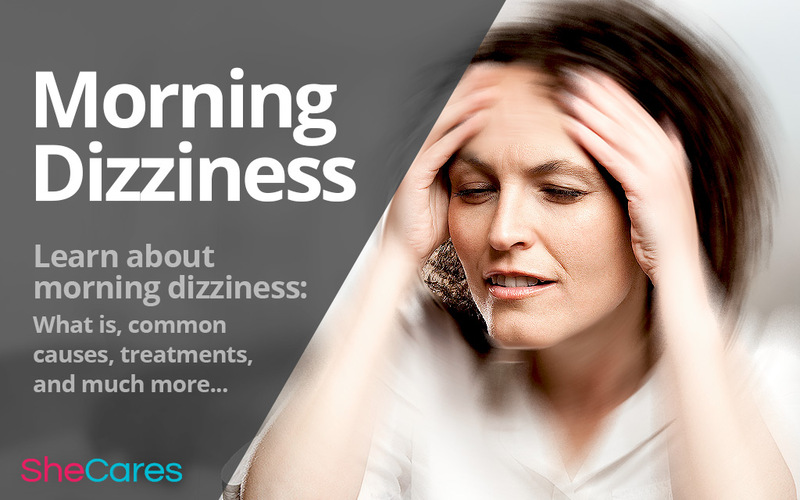 Depending on the reason behind your individual experience of morning dizziness, there are a few different ways that might be successful in treating or alleviating it. Some common techniques include the following. It is important to maintain a healthy diet and eat at regular intervals. If you suffer from hypoglycemia in the morning, a protein-based breakfast such as one including eggs should give you the boost you need. You should take your time when getting out of bed, and be careful not to rush into standing up. If the dizziness does present itself, you should sit or lie down again for a short period. Try taking naps throughout the day if your routine allows. Keeping a sleeping journal or schedule may help with this. Limit your intake of alcoholic beverages. It is important to enjoy them in moderation because they can increase your chances of experiencing dizziness. If you find that you are frequently feeling dizzy in the morning, the likelihood is that it will be due to one of the aforementioned factors. However, if you feel that none of these apply to you, and you are concerned about the prevalence or severity of your experience, it is important to discuss the situation with your doctor. It is possible for dizziness to be a symptom of a more serious health matter. Figueroa, J. et al. (2010).